In this article, I will let you know how to insert or save any digital information such as a file, image, video, or a song as a blob data into MySQL table from python. We will also learn how we can fetch the file, image, video, or a song stored in MySQL using Python. 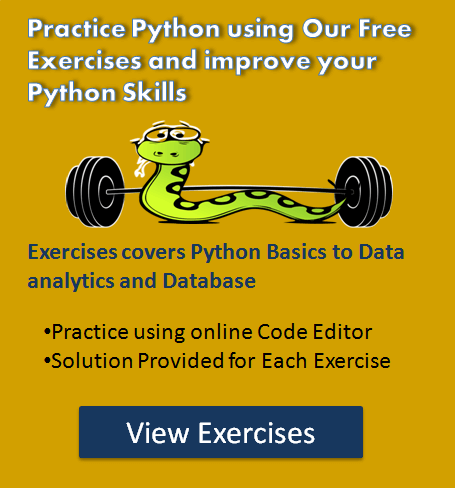 And Free Python Database programming Quiz to practice and master the Database skills in Python. Insert binary data into a MySQL table using Python. Read BLOB data files from MySQL table in Python. Understand how to use MySQL BLOB to store and fetch digital information in Python. Note: We are using MySQL Connector Python module to communicate with MySQL. To Store BLOB data in MySQL table, we need to create a table which can hold binary data. Alternatively, if you have a table then modify it and add one extra column with BLOB as its data type. You can use the following query to a create table with a BLOB column. This table contains the following two BLOB columns. A photo which contains employee picture. Biodata file which contains employee details in file format. 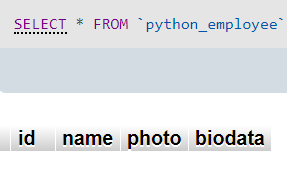 The python_employee table is empty as of now let’s insert employees photo and bio-data file in it. Before executing the following programs, please make sure you have the Username and password that you need to connect MySQL. A BLOB (large binary object) is a MySQL data type which can be used to store binary data. We can convert our files and images into binary data in Python and store it in MySQL table using BLOB. Note: To insert file or image into MySQL table we need to create a column which has a BLOB as a type. MySQL has the following four BLOB types. Each holds a variable amount of data. Above BLOB types differ only in the maximum length of the values they can hold. To read more on BLOByou can visit this MySQL BLOB document. Second, Establish MySQL database connection in Python. Create a function that can convert image and file into binary data. Then, Define the Insert query to enter binary data into the database table. All you need to know is the table it’s column details. Execute the INSERT query using cursor.execute(). In return, you should get some rows affected. After successful execution of the query, commit your changes to the database. Close the Cursor and MySQL database connection. Let see the example now. (`id`, `name`, `photo`, `biodata`) VALUES (%s,%s,%s,%s)"""
Note: We inserted employee id, name, photo and bio-data file. For image and bio-data, we passed the location where it is present. As you can see we converted our image and file into a binary format by reading image and file in ‘rb‘ mode before inserting it into a BLOB column. Also, we used a parameterized query to insert dynamic data into a MySQL table. Let’s have a look at python_employee table after inserting image and file into it. 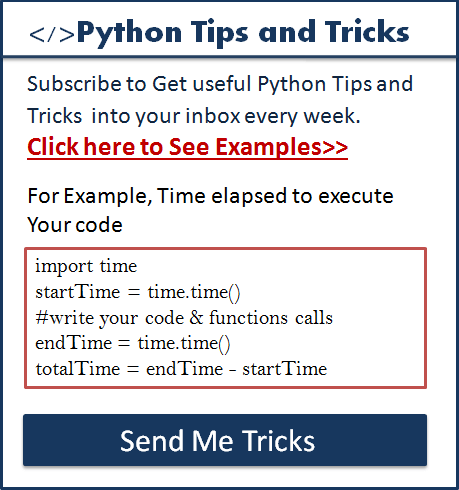 check out our Python Database Programming Exercise once. Suppose we want to read the file or images stored in MySQL table in binary format and write that file back to some arbitrary location on the hard drive. Let see how we can do that. Read employee image, and file from MySQL table stored as a BLOB. Write this BLOB binary data on a disk. To write this binary data on hard disk we can pass file format in which we want it to be displayed. Then, Define the SELECT query to fetch BLOB columns values from the database table. Use cursor.fetchall() to retrieve all the rows from the result set and iterate over it. Create a function to write BLOB or binary data that we retrieved from each row on disk in a correct format. 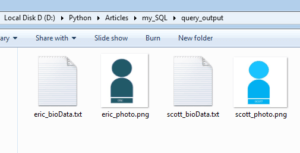 sql_fetch_blob_query = """SELECT photo from python_employee where id = %s"""
Retrieved image and file from MySQL table and stored on disk. I’m just comment your solution. You gets a warning about truncated data if you put an image larger than 64k. What is the bioData file for? I’m getting error ” ‘long’ objects is not iterable” while executing the file. This is my code. Actually this code is working fine in localhost. But in AWS shows an error that I mentioned earlier (” ‘long’ objects is not iterable” ).